On my return from Spain, I went for a walk in the woods with my parents, followed by a very fine pub lunch. While we were ambling through the trees, I came to notice that the leaves underfoot were littered with that most autumnal of things, the sweet chestnut. I began to pick up these prickly objects, shell them and stuff my pockets with them. I love sweet chestnuts, so by the time I was finished, with some help from my parents, my hoody pouch was hanging low with its tasty burden and the pockets of my jeans were bulging. I looked like I had some kind of odd deformity. Like piles or something. The next night, I roasted some of my chestnuts and scattered them over a salad of figs and blue cheese on a bed of wilted spinach. It was fit for the queen I believe myself to be. Why didn't I just stop there? But instead, I spent interminable hours scoring and then roasting chestnuts. Peeling, chopping and roasting them again. Blitzing them in a blender and sieving them to remove any lumps. 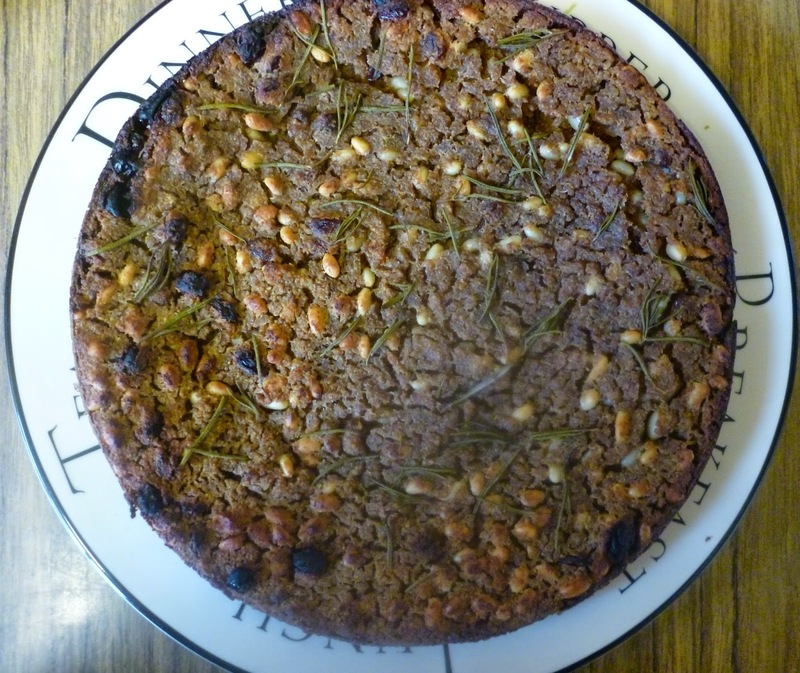 This is castagnaccio, an Italian 'cake' make with chestnut flour, water, raisins, rosemary and pinenuts. I say 'cake' but it's actually quite a savoury flavour and not a cakey texture at all. Although chestnuts are naturally sweet, there was no sugar, fat or eggs added and these are the very ingredients that give cake its usual qualities. Still, it's nice to try something different and once you have the chestnut flour it is simplicity itself to make. However, making chestnut flour is not something to be taken lightly. I am not exaggerating when I say it took me several hours over several days. I have included instructions on how to produce the damned stuff, but if you can possibly obtain it by any other means for pity's sake do! It won't be easy - the health food store I thought would stock it didn't and Sainsbury's was sadly lacking too. You may be wondering what the attraction of this cake is if it's so difficult to get chestnut flour. I'll tell you: it's gluten-free, vegan, high in protein, contains no added sugar and the only added fat is a bare teaspoon of olive oil. So if you are afflicted by coeliac's disease or worse, veganism (joking, vegans! Sort of...) this is a treat for you that needn't trouble your tummy or your conscience. If you have got chestnut flour rather than chestnuts, start from stage 4 of the recipe. 1. Preheat the oven to 180C. Score the chestnuts in a deep cross at the top and peel the shell away slightly - this will make the chestnut easier to peel later. Throw away any nuts where you see signs of discolouration or mould - they will contain maggots. Roast for 30 minutes. 2. Peel the chestnuts, taking off both the tough outer shell and inner skin. 4. Mix the flour with the water a little at a time, aiming for a consistency that falls off the spoon but is not watery or sloppy. Add the raisins, pine nuts, and olive oil and pour into a greased and lined tin - the batter should be about 1cm thick. 5. Scatter the rosemary needles over the top of the cake and bake for 30-40 minutes until the batter is set and cracks appear in it. I showed a picture of the finished castagnaccio to an Italian friend called Giulia and she said it looked exactly as it should - although as you can see it's caught a little on the sides. To avoid this you'll want to use a smaller tin than I did. You can see the castagnaccio is nearly as big as a dinner plate so just be sure to use a much smaller tin. The cake will keep for a few days wrapped in foil but may dry out a little. Sometimes the Italians eat it spread with ricotta apparently.